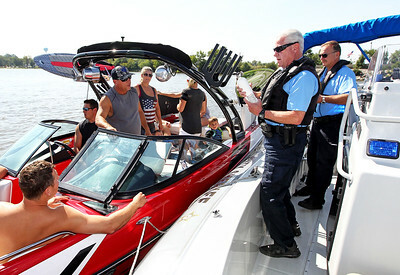 Candace H. Johnson-For Shaw Media Senior Deputies Steve Wernikoff and Al Frank with the Lake County Sheriff's Office Marine Unit watch boaters as they patrol the Chain O'Lakes. 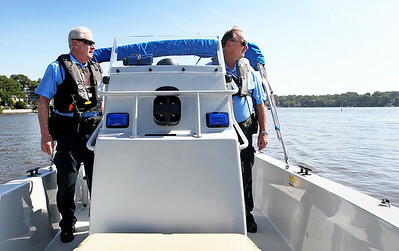 Candace H. Johnson-For Shaw Media Senior Deputies Steve Wernikoff and Al Frank with the Lake County Sheriff's Marine Unit patrol the Chain O'Lakes. Part of their job is educating the public about the laws on the water. They patrol over 90 miles of channels on the Chain O'Lakes. 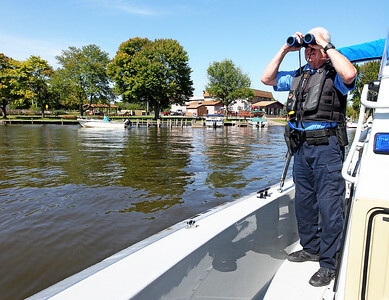 Candace H. Johnson-For Shaw Media Senior Deputy Steve Wernikoff stands next to Al Frank with the Lake County Sheriff's Office Marine Unit as he checks the expiration date on a fire extinguisher during a traffic stop of a boat on the Chain O'Lakes. They were stopped because one of their passengers were sitting on the back of the boat. 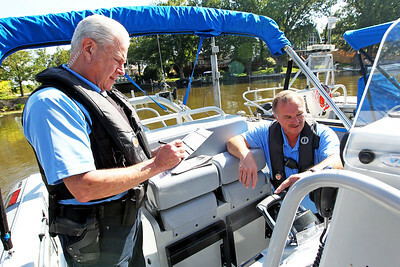 Candace H. Johnson-For Shaw Media Senior Deputy Steve Wernikoff with the Lake County Sheriff's Office Marine Unit talks with Matthew Bach, of Columbus, Ohio and Kari Rankin, of Crystal Lake to check if their boat battery is properly fastened and covered during a safety check while on a patrol in the Chain O'Lakes. 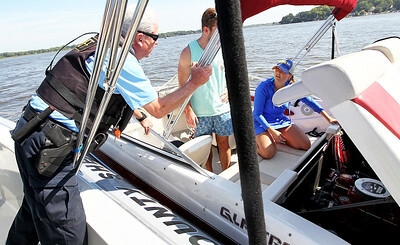 Candace H. Johnson-For Shaw Media Senior Deputies Steve Wernikoff and Al Frank with the Lake County Sheriff's Office Marine Unit do a safety check of their boat at the start of their shift before they patrol the Chain O'Lakes. 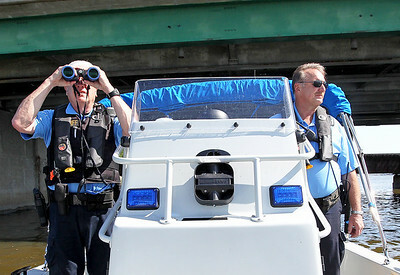 Candace H. Johnson-For Shaw Media Senior Deputy Steve Wernikoff with the Lake County Sheriff's Office Marine Unit uses his binoculars to check on boaters while on a patrol in the Chain O'Lakes. Candace H. Johnson-For Shaw Media A boat displays an orange flag to notify others they are pulling someone on a tube on the Chain O'Lakes. It is the law that you must display an orange flag 12"X12" if you are pulling someone in the water. For example: water skiing, tubing, and wave surfing. 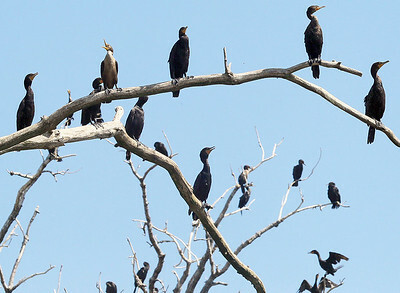 Candace H. Johnson-For Shaw Media Double-crested cormorants sit on a tree near Ackerman Island on the Chain O'Lakes. 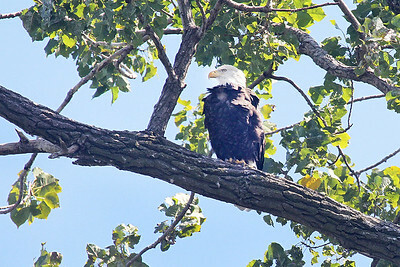 Candace H. Johnson-For Shaw Media An Eagle sits on a tree near Ackerman Island on the Chain O'Lakes. Senior Deputy Steve Wernikoff with the Lake County Sheriff's Office Marine Unit uses his binoculars to check on boaters while on a patrol in the Chain O'Lakes.